Experience world class shopping all over the Coachella Valley from high fashion to vintage and everything in between. Check out El Paseo shopping district which is known as the "Rodeo Drive" of the Coachella valley. Here you will find the best of the best including Saks Fifth Avenue, Louis Vuitton, Gucci, Escada, Bottega Vanetta, Kate Spade and local favorites such as Apple, Lucky Brand, Johnny Was, Teavana and Anthropologie....you can even test drive a Tesla. FROM DELECTABLE DINING TO EXQUISITE SHOPPING, EL PASEO INDULGES ALL SENSES. 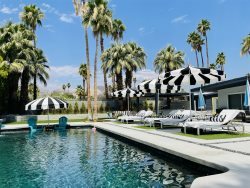 Browse your favorite luxury labels and chic boutiques, savor gourmet cuisine by the Coachella Valley�s top chefs, and wander through an array of art galleries set against a scenic backdrop in this gem tucked in the heart of Palm Desert. Enjoy El Paseo After Dark and First Weekend on the first Friday of each month (November through May) and the alluring and prestigious annual Fashion Week El Paseo and Palm Desert Food & Wine Festival. Among its 250-plus retailers, the mile-long strip features locally owned boutiques; top international retailers such as St. John, Gucci, and Burberry; brilliant fun and fine jewelry; eclectic artworks; sleek and sophisticated home d�cor; and professional services including day spas, beauty bars, and interior design know-how. With so much to do and see, it�s easy to pass an entire day on El Paseo. Sip a cappuccino or a cup of tea at a sidewalk caf� before exploring the avenue. Stop for a mid-spree refreshment at any of the two dozen dining establishments, offering everything from French fare to fresh Pacific seafood. After dropping off your treasures at your car via a sunny yellow courtesy cart, stay for dinner and unwind. Many of the restaurants offer alfresco dining, where you can enjoy a glass of wine, fine meal, and dessert on a mountain-view terrace. Conveniently situated in the center of the valley, El Paseo also offers the ideal proximity to renowned resorts, celebrated golf courses, performing arts venues, and picturesque drives deep into the Santa Rosa & San Jacinto Mountains National Monument. Conveniently located between Palm Springs and Los Angeles, Cabazon Outlets offers a unique desert landscape shopping experience nestled between the Santa Rosa and San Gorgonio Mountain Range. This quaint 65,000 square foot retail shopping center features 18 specialty retailers in a relaxed open-air environment. Cabazon is a name that has become synonymous with quality outlet shopping and is a destination for over 15 million shoppers every year. The architectural focal point of the center is a copper-clad Florentine dome. The dome is crowned by a lantern and spire, which stands over an elaborate stone compass inlay, identifying local landmarks and orienting customers to other destinations.